Ingredients: Aqua (Water), C12-15 Alkyl Benzoate, Butylene Glycol, Dimethyl MEA (DMAE), Glyceryl Polymethacrylate, Citric Acid, Glycerin, Glyceryl Stearate, PEG-100 Stearate, Avena Sativa (Oat) Protein Extract, Cetyl Alcohol, Tribehenin, Simmondsia Chinensis (Jojoba) Seed Oil, Isopropyl Palmitate, Dimethicone, PEG-8, Phenoxyethanol, Phosphatidylcholine, Tetrahexyldecyl Ascorbate, Triethanolamine, L-Tyrosine, Carbomer, Caprylyl Glycol, Ceramide 2, PEG-10 Rapeseed Sterol, Disodium EDTA, BHT, Sodium Carboxymethyl Beta-Glucan, Ammonium Acryloyldimethyltaurate/VP Copolymer, Magnesium Aspartate, Zinc Gluconate, Sorbic Acid, Elaeis Guineensis (Palm) Oil, Tocotrienols, Cetyl Hydroxyethylcellulose, Polysorbate 20, Rutin, Tocopherol, Copper Gluconate, Ascorbyl Palmitate, Palmitoyl Oligopeptide (Neuropeptide), Palmitoyl Tetrapeptide-7 (Neuropeptide), Parfum (Fragrance), Phaseolus Lunatus (Green Bean) Extract. Restore your skin's youthful appearance with Perricone MD's regenerating serum. 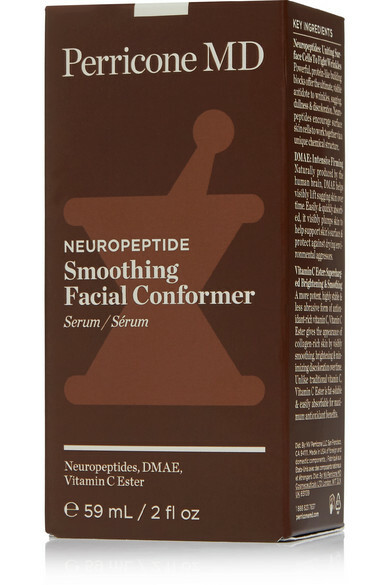 Packed with the brand's signature Neuropeptides, this nourishing treatment activates the dermal surface, smooths fine lines and combats signs of aging. Anti-inflammatory DMAE firms and tones to enhance facial contours, while reparative Phospholipids hydrates the skin by locking in moisture.